Messi had not played for the national team since their elimination by France at the 2018 World Cup. LIONEL MESSI’S RETURN to the Argentina side ended in a shock 3-1 friendly defeat to Venezuela in Madrid on Friday. 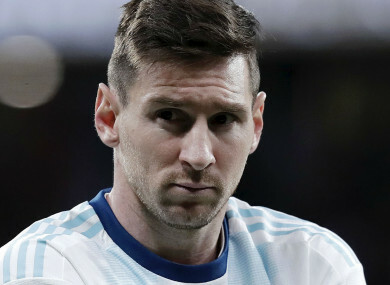 Messi had not played for the national team since their last-16 elimination by eventual winners France at the 2018 World Cup – a tournament for which Venezuela finished bottom of South American qualifying. But it was Rafael Dudamel’s men who stole the show at the Wanda Metropolitano, with Salomon Rondon and Jhon Murillo firing them into a 2-0 lead in the first half. Lautaro Martinez pulled one back for Argentina after the interval but this was a poor showing from Lionel Scaloni’s side, whose fate was sealed by a Josef Martinez penalty 15 minutes from time. Venezuela took their unexpected lead when a ball over the top from Roberto Rosales was brilliantly brought down and prodded home by a composed Rondon after only six minutes. Wuilker Farinez produced a spectacular save to keep out a close-range Lautaro Martinez header on the half-hour mark. Messi had delivered the cross for Lautaro Martinez’s headed effort and witnessed Farinez’s talents first-hand when his strike from the edge of the box was tipped over the crossbar by the goalkeeper. Darwin Machis and Rondon squandered opportunities before Murillo deservedly doubled Venezuela’s advantage, capitalising on a quickly taken free-kick to curl a wonderful effort beyond the reach of Franco Armani from 18 yards. When Argentina’s response arrived, it happened in the blink of an eye. A rapid counter-attack involving Messi ended with Giovani Lo Celso playing a perfect pass into the path of Lautaro Martinez, who made no mistake with a cool finish. Argentina piled on the pressure in pursuit of an equaliser but were fortunate to avoid giving away a penalty when Machis went down under the challenge of Leandro Paredes. Venezuela did get their spot-kick in the 75th minute after Juan Foyth clumsily brought down substitute Josef Martinez, who sent Armani the wrong way with a peculiar penalty routine, running up and leaping into the air before striking the ball. Email “Lionel Messi's long-awaited international return ends in shock defeat to Venezuela”. Feedback on “Lionel Messi's long-awaited international return ends in shock defeat to Venezuela”.